This is my first attempt at Anna-Karin's technique of using gesso, dry embossing, and acrylic paint! The stamp is from Unity's "Tags, Glorious Tags". Wow, this is beautiful. Lovely artwork. 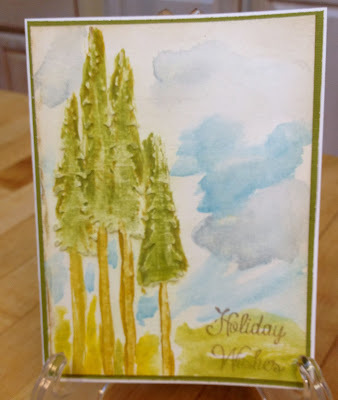 Wow, your card is beautiful - love the painted trees! Beautiful card! Love the painted look! Beautiful card! I'm going to have to try that technique. That is one lovely scene you have created! Love the painting! Looks very artsy & cool! Lovely mixed media card, Barb.